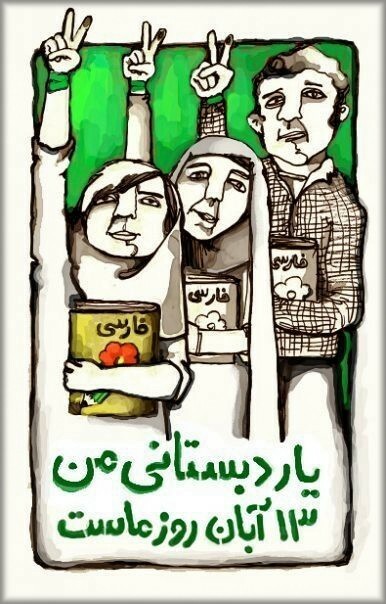 An exhibition of 13 selected posters made by supporters of Green movement in Iran to encourage people to protest on Students’ day. 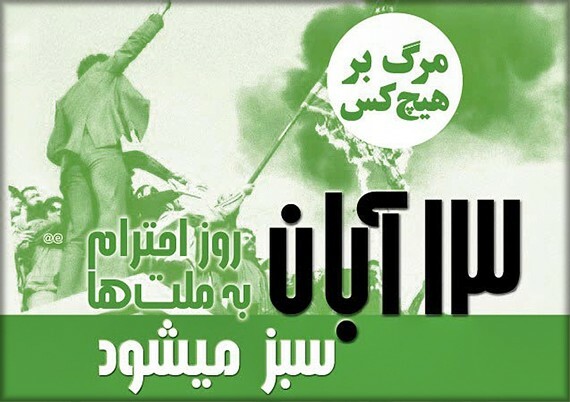 According to an unofficial Iranian state media, Fars, last year thousands of people gathered around the old US embassy walls that students scaled on November 4, 1979, chanting different slogans, including “Death to America”. 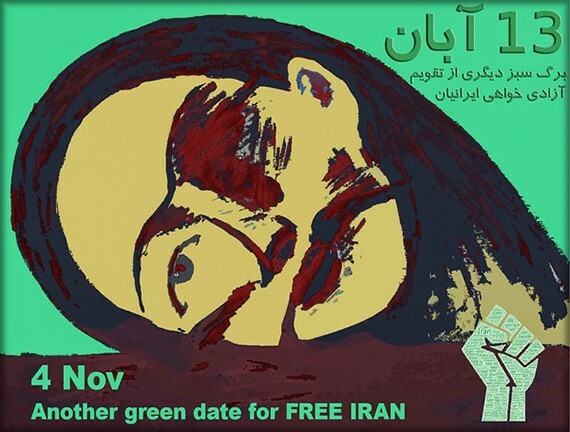 This year, the Green movement supporters also would like to participate (since there is no need to get permission to protest and be denied). 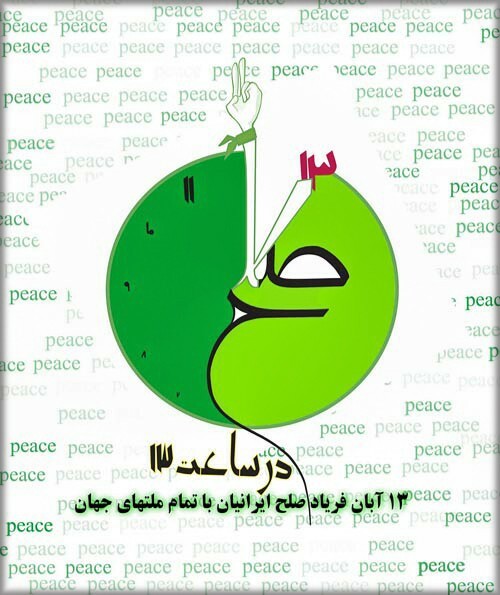 Unlike last year Green posters says “Death to No One”, and have more messages of peace. 2- My Schoolmate (part of a famous revolutionary poem) Nov. 4th is our day. 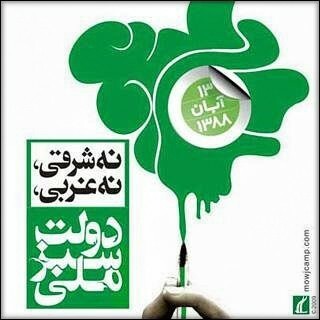 3- Nov. 4th Hope for a free Iran. 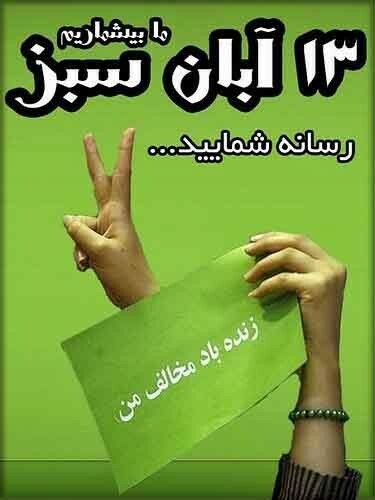 4- Nov. 4th, Iranians scream peace with all countries of the world. 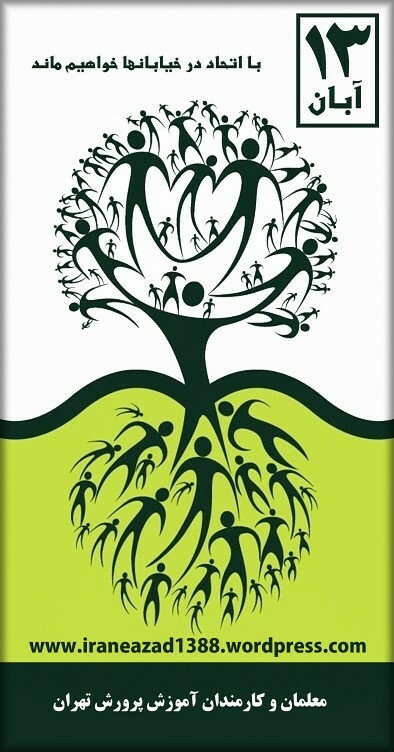 6- Death to no one, day of respect for other nations grows (goes green) on Nov. 4th. 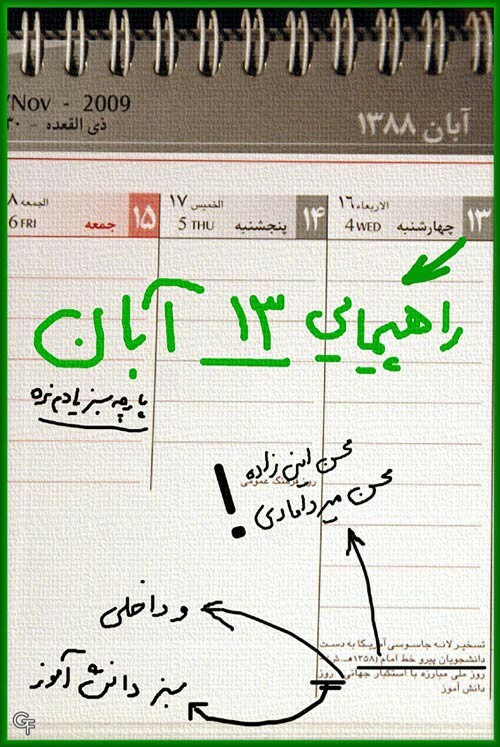 7- Top: 13 Aban, Nov. 4th demonstration, a note to remember to get green cloth. Middle: Names of two people responsible for US embassy takeover. 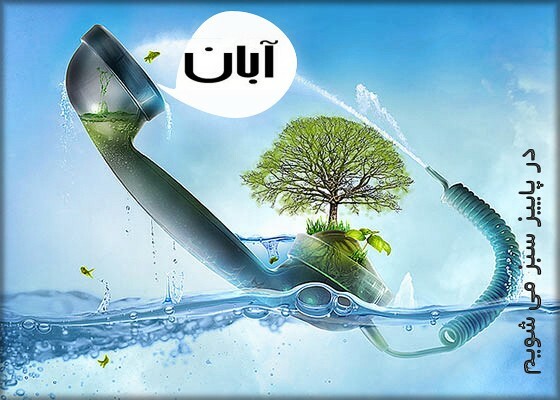 Bottom: the word “and internal” added to “combating world/external Arrogance”, and the word “Green” added to “students’ day”. 8- We’ll grow (go green) in Autumn. 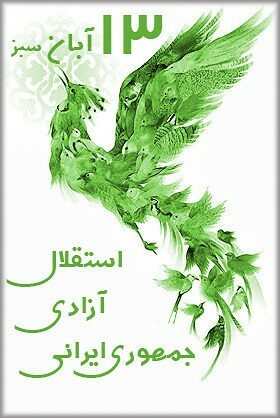 10- Another green date in freedom seeking calendar of Iran. 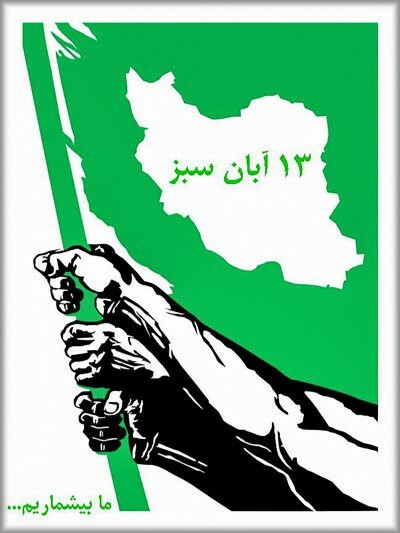 11- Green Nov. 4th; Independence, Freedom, Iranian Republic. 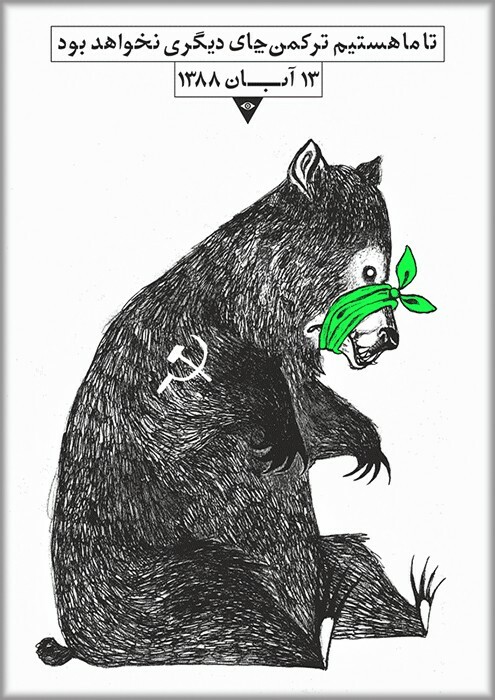 12- Nov. 4th; Not Western, Not Eastern, National Green Government. 13- Nov. 4th Top: We’ll stay in the streets united. 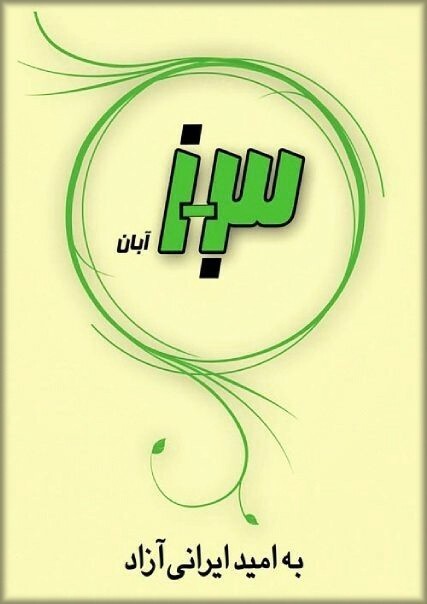 Bottom: Teachers and employees of Tehran Education Ministry.